Hi I’m Pammie and I guess most people know me from the vast number of photos I’ve taken over the years at the cross races. It’s only more recently I’ve been dipping my SPD's into the world of ‘racing’ cross! I found out how much I loved cycling around 6 years ago when I joined the Glasgow Mountain Bike Meetup. This led to a number of social weekenders and I ended up regularly hosting rides as a result. My roots are in mountain biking but I now ride road and cross - I love all disciplines (except track but that’s a whole other story!) I am the proud owner of 3 mountain bikes, 2 road bikes and my trusty cross bike. Cycling has allowed me to meet so many amazing people, I would say I’m probably more of a social cyclist, I love a cafe ride. I’ve been spectating and taking photos at cross races since 2014 (I think) I love taking photos at the races, people always send me messages after asking if I got any shots of them to use for their blogs so the pressure is always on! It’s a lovely feeling when someone uses one of your photos. I started watching the kids races and then it just grew from there. I remember being a spectator and think in that looks like it could be fun but I didn’t have a cross bike at the time. Riding a mountain bike in a race is bloody hard work by the way, so hats off to anyone who does! 4. 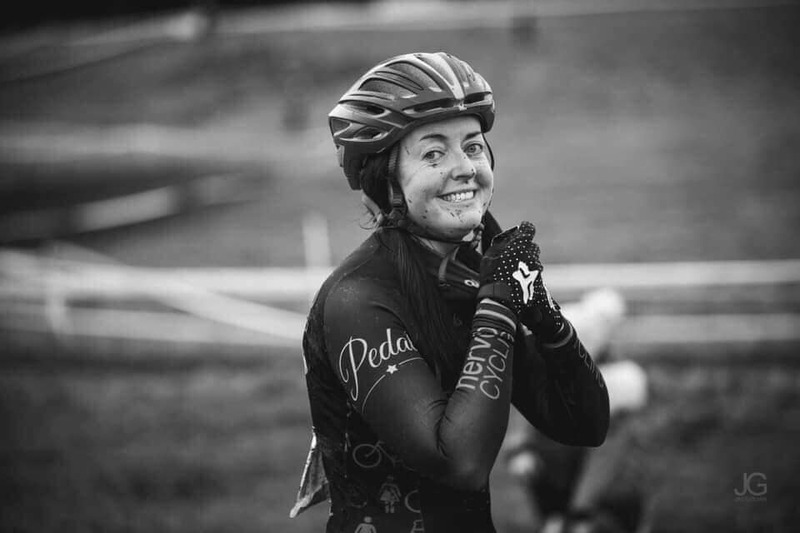 Can you remember the first CX race you went to, and how did it go? The first race I ever took part in was, believe it or not, The Tosh! I didn’t know at the time it would be the last one. I was overdressed, wearing waterproof baggies and riding a 29er! I vividly remember the commentator saying that’s 8 minutes into the race and thinking how the hell am I ever gonna finish, this is so hard. I think Isla lapped me three times that day haha! It’s good to look back on and think I only get lapped once by her now - surely that’s progress? 5. What's the craziest thing you've seen at a cross race? Craziest thing I’ve seen at a cross race is definitely Tam Gordon at Bute this season, I was on the start line and he came pedalled down through all the riders and got in position as if he was going to race. It was a sight to behold as he was kitted out on his TT bike with all his gear on as he was doing the 2Up and the timings didn’t quite work out so he couldn’t do the cross race too as planned. I genuinely thought he might give it a go, he’s that type of guy. One of a kind. 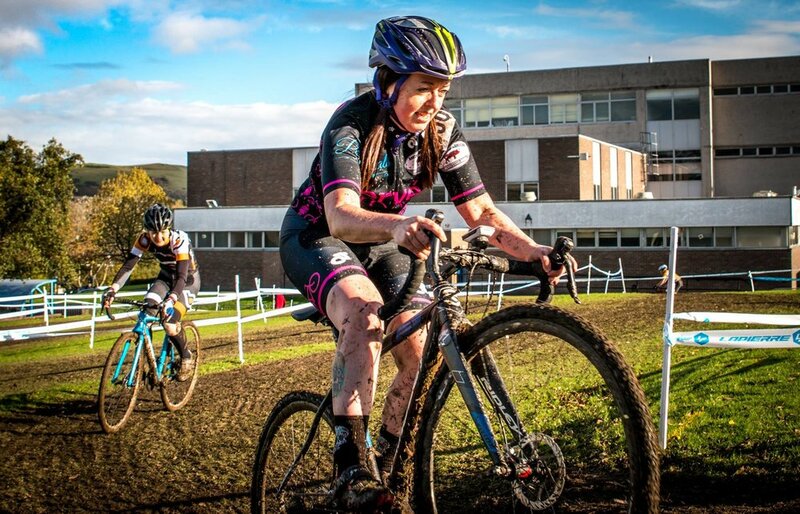 Kerry MacPhee winning at Dunfermline last season on her full suss mtb was pretty crazy too! 6. What's the most embarrassing thing you have done at a race, on or off a bike? I’ve yet to fall off in front of anyone at a cross race but some folk say that’s cause you’re not trying hard enough 😉. I can neither dismount or remount with the grace of Cammy Mason so I would say I’m a total embarrassment on that front. Davie Graham has tried his hardest to help me improve, so my goal for next season is to put some time and effort into nailing it once and for all. Oh my days, how can you choose? There are so many amazing courses so this is a very difficult choice. For me it’s a toss up between Rouken Glen and Mull. The ‘pro’ set up at RGCX makes for a great atmosphere and there’s always loads of good banter on the climbs and plenty of time for folk to shout abuse at you. It’s also a really challenging course as there is no let up at all. I’m so sad that Mull will be no more as it’s the definitely the best place to go for a social weekender, this season I decided not to race there and now of course I’m full of regret but I had such an amazing time with my pals and the weather was top drawer. Even though I detest the spiral of doom, I actually really enjoyed Lochore this season, I had a great wee race with Catherine Logan and nearly got knocked off my bike by Eileen, ha. I admire anyone who has the guts to pin a number on, it’s probably one of the hardest things to do. Once you get over that feeling and the pre race nerves then it’s actually fun... Once it’s over! For me, Roisin Gordon really makes me feel inspired because she never fails to turn up at the start line race after race, she shows up whilst I wimp, out so next season I’m gonna more like her 🙂. I also really admire girls who are supportive and encourage you to be your best. The McGorum girls and the Carrick Andersons are amazing cyclists as well as lovely people so I would add them to my list too. There are too many fantastic people to mention! 9. Any particular highlights from last season? I had a rather disappointing season in terms of the number of races I took part in but I really enjoyed SCX1 at Bute for many reasons, coming through the flat section at the pits was brilliant fun as loads of people were there shouting encouragement and cheering me on. The power of someone shouting your name out in a race is just amazing and it truly helps even us mere minions at the back! 10. Finally, what are you looking forward to for this season. I’m Jac Marquis (also known as “Stracky Jachan”, “Jackie Strachan”, “Jac the Minx” or “One of our Tailenders” depending on who’s doing the commentating). As well as riding and racing cross, I also ride endurance MTB, singlespeed and enduro as well as just mucking about on my bike in the woods!